Finding a new job is a challenge—the right company, the right position, the right pay. These job search engines will make the process of finding your next job easier and faster. Monster.com was one of the first job search engines on the internet. While it may not be the undisputed champion of job search today, it still is relevant and popular with job seekers and employers. You can search for a job you like using the job title or relevant keywords, or use the extensive filters to shortlist available jobs. Apart from just job listing, Monster.com also has a few add-on services that will help your profile get noticed by potential employers. These services include professional resume writing, resume highlighter, and a job-search expediter. Monster.com is free for job seekers, and employers pay a nominal fee to have access to a large pool of potential employees. LinkedIn is a unique job search engine as it combines the power of professional social networking with job searching. While LinkedIn has a dedicated job portal on its website, it’s estimated that most of the jobs found on LinkedIn are through networking. Even LinkedIn’s research concluded that close to 67% of jobs are found through personal recommendations. Considering that, LinkedIn is a great place not only to find jobs but also to connect with people in the industry in which you work. Glassdoor is another popular job search engine with a different approach to job hunting. When you search for a job on Glassdoor.com, you’ll get all the basic information about each job that interests you. You can manage your job-hunting better with useful features like searching, filtering, tracking, and so on. What sets Glassdoor.com apart is that also hosts a plethora of user-generated information about companies. This information includes company reviews, interview questions, salary reports, and more. This information can give you the edge when you’re looking for the perfect organization. Simplyhired is a popular job aggregator with millions of jobs listed on the website. You start by entering a few keywords about the job you’re looking for and hitting search. You can then select your desired jobs from the jobs that appear and apply for them. Since SimplyHired is a job aggregator and not a job board, you’ll be taken to the employer’s website or another portal where you’ll be able to submit your resume or other documents as needed for the recruitment process. AngelList is a fantastic job search site if you’re looking to get hired by startups or fast-growing tech companies. Unlike other sites, you can’t see all the open jobs on AngelList without creating an account. Once you do create your account, you can see all the jobs, upload your resume, and start applying. The interesting thing about AngelList is that all the job listings are posted by the companies themselves, and you can see your potential salary, equity, and stock options upfront—even before applying to the job. Other websites on this list help you find all sorts of jobs, but, Dice.com is different. It’s a job search portal only for tech jobs. You can search using keywords, job titles, company name, or using the trending jobs section. But, if you’re in the tech business, the specificity of jobs is what makes Dice.com different from other job search websites. If you create an account (for free), you can also upload your resume on the site. Having an account also lets you get salary information and track jobs for which you’ve applied. If you’ve searched for jobs on Google, you might have noticed that Google displays relevant jobs in a rich-snippet search result. If you click the “100+ more jobs” link, you’ll reach Google’s job search portal. The portal doesn’t have an official name, but it acts like a job search engine. The jobs there are aggregated from multiple websites, which saves time on job-hunting. 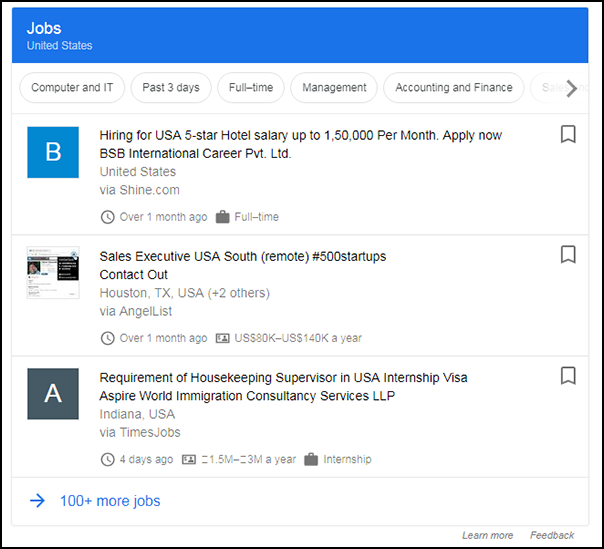 There are plenty of filters to search for the job you prefer, and you can bookmark individual jobs for later viewing. You can also set an alert for a particular job search that you perform and receive email alerts when similar jobs are posted.